Anyway, this debate was talking about the fact that the Bank of England had decided to redesign the £5 note, as it does with all notes occasionally, and it would now feature Winston Churchill. 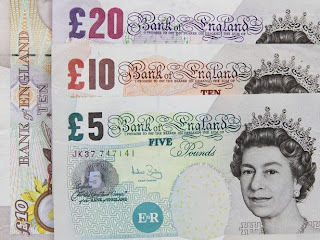 I admire Churchill, but a controversy had arisen because it would mean that UK banknotes now only pictured men. Naturally the protest arose that it was just as important to celebrate the enormous contribution that women had made to British history. A petition arose and apparently it was successful because we have just heard that the £10 note is also to be redesigned and Charles Darwin will gave way to Jane Austen. I'm very happy about having a woman, and a writer, featured on the money I use every day. Especially that it's Charles Darwin who is being ousted, because he in turn replaced Florence Nightingale who is, according to family lore, among my ancestors. I look forward to seeing Mary Wollstoncraft, Virginia Woolf and George Elliot nestling amidst the receipts in my purse someday. JK Rowling isn't eligible, because you have to be a dead historical figure, apparently. But perhaps the amusing PS to this story about all the protests that the notes only feature men is that if you turn them over they all have a picture of the Queen. Jane Austen? Love it! Maybe someday you’ll be on one of those notes, Anna!